Schaefer M, Gold B, Linde R, et al. Program Confinement in KVM/370[C]. Proceedings of the 1977 ACM Annual Conference, 1977. 1977: 404–410. Gold B D, Linde R R, Schaefer M, et al. VM/370 Security Retrofit Rrogram[C]. Proceedings of the 1977 ACM Annual Conference, 1977. 1977: 411-418. Seawright L H, Mackinnon R A. VM/370 - a Study of Multiplicity and Usefulness[J]. IBM Systems Journal. 1979. Creasy R J. the Origin of theVM/370 Time-sharing System[J]. IBM Journal of Research and Development. 1981. Goldberg R P. Architecture of Virtual Machines[C]. Proceedings of the Workshop on Virtual Computer Systems, 1973. 1973: 74-112. Waldspurger C A. Memory Resource Management in VMware ESX Server[C]. Proceedings of the 5th Symposium on Operating Systems Design and Implementation (OSDI '02), 2002. 2002: 181-194. Barham P, Dragovic B, Fraser K, et al. Xen and the Art of Virtualization[C]. Proceedings of the 19th ACM Symposium on Operating Systems Principles (SOSP'03), 2003. 2003: 164-177. Ian P, Keir F, Steve H, et al. Xen 3.0 and the Art of Virtualization[C]. Proceedings of the Ottawa Linux Symposium, 2005. 2005: . Clark B, Deshane T, Dow E, et al. Xen and the Art of Repeated Research[C]. Proceedings of the USENIX Annual Technical Conference, 2004. 2004: 47-56. Whitaker A, Shaw M, Gribble S D. Denali: A Scalable Isolation Kernel[C]. Proceedings of the 10th ACM SIGOPS European Workshop, 2002. 2002: 10-15. Whitaker A, Shaw M, Gribble S D. Denali: Lightweight Virtual Machines for Distributed and Networked Applications[R]. University of Washington Technical Report 02-02-012002. Whitaker A, Shaw M, Gribble S D. Scale and Performance in the Denali Isolation Kernel[J]. ACM SIGOPS Operating Systems Review, OSDI '02: Proceedings of the 5th Symposium on Operating Systems Design and Implementation. 2002, 36(SPECIAL ISSUE: Virtual machines). Sugerman J, Venkitachalam G, Lim B H. Virtualizing I/O Devices on VMware Workstation's Hosted Virtual Machine Monitor[C]. Proceedings of the 2001 USENIX Annual Technical Conference, 2001. 2001: 1-14. Robin J S, Irvine C E. Analysis of the Intel Pentium's Ability to Support a Secure Virtual Machine Monitor[C]. Proceedings of the 9th USENIX Security Symposium, 2000. 2000: 129–144. Yaozu D, Shaofan L, Asit M, et al. Extending Xen with Intel Virtualization Technology[J]. Intel Technology Journal. 2006, 10(3): 193-203. Gupta D, Gardner R, Cherkasova L. XenMon: QoS Monitoring and Performance Profiling Tool[R]. Tech Report: HPL-2005-1872005. 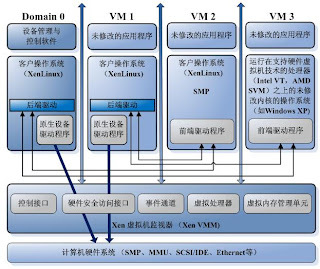 Haifeng X, Sihan Q, Huanguo Z. XEN Virtual Machine Technology and Its Security Analysis[J]. Wuhan University Journal of Natural Sciences. 2007, 12. Anwar Z, Campbell R H. Secure Reincarnation of Compromised Servers using Xen Based Time-Forking Virtual Machines[C]. 5th IEEE International Conference on Pervasive Computing and Communications Workshops (PerComW'07), 2007. 2007: 477-482. Fraser K, Hand S, Neugebauer R, et al. Safe Hardware Access with the Xen Virtual Machine Monitor[C]. 2004. 2004: 1-10. Quynh N A, Takefuji Y. A Novel Approach for a File-system Integrity Monitor Tool of Xen Virtual Machine[C]. Proceedings of the 2nd ACM Symposium on Information, Computer and Communications Security, 2007. 2007: 194-202. Gardner L C. Measuring CPU Overhead for I/O Processing in the Xen Virtual Machine Monitor[C]. USENIX 2005 Annual Technical Conference, 2005. 2005: 387-390. Chen H, Chen R, Zhang F, et al. Live Updating Operating Systems Using Virtualization[C]. Proceedings of the 2st ACM/USENIX International Conference on Virtual Execution Environments, 2006. 2006: 35-44. Kourai K, Chiba S. HyperSpector: Virtual Distributed Monitoring Environments for Secure Intrusion Detection[C]. Proceedings of the 1st ACM/USENIX International Conference on Virtual Execution Environments (VEE'05), 2005. 2005: 197-207. Youseff L, Wolski R, Gorda B, et al. Evaluating the Performance Impact of Xen on MPI and Process Execution for HPC Systems[C]. the First International Workshop on Virtualization Technology in Distributed Computing (VTDC), held in conjunction with Supercomputing (SC06), 2006. 2006: 1-8. Gupta D, Cherkasova L, Gardner R, et al. Enforcing Performance Isolation Across Virtual Machines in Xen[C]. Proceeding of the ACM/IFIP/USENIX 7th International Middleware Conference (Middleware'06), 2006. 2006: 342-362. Menon A, Santos J R, Turner Y, et al. Diagnosing Performance Overheads In the Xen Virtual Machine Environment[C]. Proceedings of the 1st ACM/USENIX International Conference on Virtual Execution Environments, 2005. 2005: 13-23. Sailer R, Jaeger T, Valdez E, et al. Building a MAC-Based Security Architecture for the Xen Open-Source Hypervisor[C]. Proceedings of the 21st Annual Computer Security Applications Conference (ACSAC'05), 2005. 2005: 276-285. Uhlig R, Neiger G, Rodgers D, et al. Intel Virtualization Technology[J]. IEEE Computer. 2005, 38(5): 48-56. Abramson D, Jackson J, Muthrasanallur S, et al. Intel Virtualization Technology for Directed I/O[J]. Intel Technology Journal. 2006, 10(3): 179–192. Neiger G, Santoni A, Leung F, et al. Intel Virtualization Technology: Hardware Support for Efficient Processor Virtualization[J]. Intel Technology Journal. 2006, 10(3): 167–177. Amd. AMD64 Vrtualization Codenamed "pacifica" Technology: Secure Virtual Machine Architecture Reference Manual[Z]. 2005. Lawton K. the Bochs IA-32 Emulator Project, http://bochs.sourceforge.net[Z]. Bellard F. QEMU, a Fast and Portable Dynamic Translator[C]. Proceedings of the USENIX Annual Technical Conference (USENIX'05), 2005. 2005: 41-46. Kamp P H, Watson R N. Jails: Confining the omnipotent root[C]. 2nd International System Administration and Network Engineering Conference (SANE'00), 2000. 2000: 1-15. Evan S. Securing freeBSD using jail[J]. Sys Admin. 2001, 10(5): 31-37. Price D, Tucker A. Solaris Zones: Operating System Support for Consolidating Commercial Workloads[C]. USENIX 18th Large Installation System Administration Conference (LISA'04), 2004. 2004: 241-254. Tucker A, Comay D. Solaris Zones: Operating System Support for Server Consolidation[C]. USENIX 3rd Virtual Machine Research and Technology Symposium (VM'04), 2004. 2004: 1-2. Dike J. A User-mode Port of the Linux Kernel[C]. Proceedings of the 4th Annual Linux Showcase & Conference, Atlanta, Georgia, USA, 2000. Atlanta, Georgia, USA: 2000: 7-16. Hoxer H J, Buchacker K, Sieh V. Implementing a User-Mode Linux with Minimal Changes from Original Kernel[C]. Proceedings of the 2002 International Linux System Technology Conference, 2002. 2002: 72-82. Jeff D. User Mode Linux[M]. Prentice Hall, 2006.